Kathy Magliato, cardiac surgeon at Saint John's Health Center in Los Angeles, believes 3D technology saves lives. Her bold statement is echoed by more and more plastic surgeons each year. With the help of 3D guides—customized, 3-D printed surgical tools—physicians can simulate complex surgeries prior to operation and use the tools as points of reference throughout any procedure. Kathy is right: the guides are saving lives. Jaden and Anias McDonald's story offers a perfect example of how. Last year, Jaden and Anias McDonald shared a body. They were two of the 1 in 200,000 babies born conjoined each year in the United States. If no steps were taken to separate them, they had anywhere between a 5% and 25% chance of surviving. The boys reading together pre-surgery. Dr. James Goodrich, the boys' surgeon, was able to separate them with the help of a 3D guide that mimicked their fused skulls and neurological tissue. Using the guide, Goodrich and his team simulated the separation before surgery and determined an incision pathway that avoided vital veins and reduced neurological damage. The 3D model used to analyze the boys' cranial structures and simulate surgery. 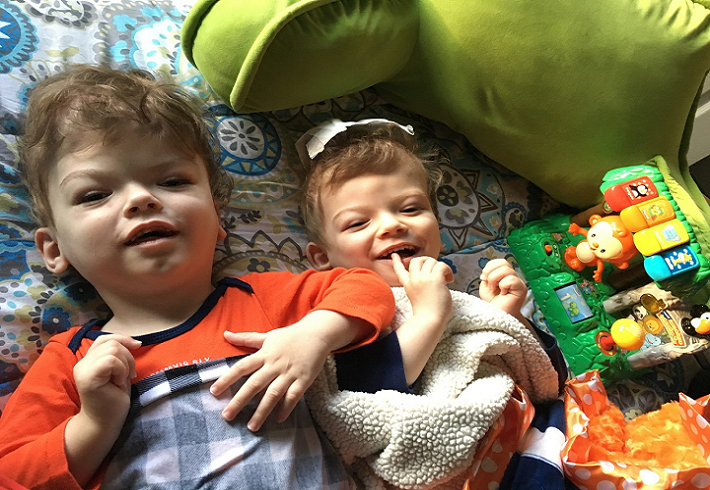 Dr. Carrie Stern, a senior resident of plastic and reconstructive surgery, recalls the gratification and relief of making the last cut separating Jaden and Anias. “It felt good...It was amazing to see the two beds slowly pull apart. As Dr. Goodrich said, 1 millimeter at a time. It was just incredible to see the one turn into two." The smiling and separated boys post-surgery (Source). Now months later, Goodrich recommends the use of 3D surgical guides not only in pediatric neurosurgery, but in other specialty fields as well. Carrie Stern has since put this idea into practice and founded MirrorMe3D, a company specializing in the production of customized 3D models and surgical guides. The guides are saving lives. They are also improving lives. Even when used in lower-risk procedures like minor cosmetic surgeries, the guides can increase incision making precision and body part functionality. In this article, we break down the 3D surgical guide. We explain its lifecycle from consultation through surgery—and show how surgeons are using it to save and improve their patients' lives. The first step in the 3D surgical guide lifecycle is the patient consultation. In order to make a guide that corrects cosmetic concerns and reconstructs body deformities, the surgeon needs to know the patient's story. Information about the patient's health concerns and history will help the physician design a surgery most appropriate for the patient as well as surgical guides to ensure the best surgical results. Once the surgeon has heard the patient's story and determined the most appropriate surgery, there are a few surgical guides he or she might consider making. There is an expansive variety of surgical guides, several of the most commonly requested (by MirrorMe3D) being those listed below. 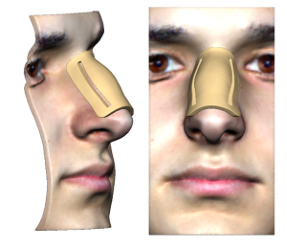 3D soft tissue nasal guides offer surgeons an accurate mold to measure their progress while performing rhinoplasty. Patient-specific marking templates for rhinoplasty streamline dorsal hump removal by increasing incision precision. Fat-injection guides are created by overlaying a 3D model of a patient's current and expected post-op face. Once surgeons overlay these before-and-after 3D models (similar to those above), they perform a volume analysis to determine how much fat must be injected to achieve the desired result. The next step in gathering information to create the 3D surgical guide is the 3D scan. Once the surgeon has chosen one of the above, another surgical guide, or designed a new one entirely, he or she will perform a 3D analysis of the area to be operated on. This 3D scan can take several forms, and can be performed as an MRI, a CT scan, a 3D light scan, or a 3D laser scan. A patient undergoes a 3D scan to assist in making accurate surgical guides (Source). Perhaps one of the most helpful kinds of information gathered from the scan is soft tissue topography data. In addition to providing baseline data to make the surgical guide, this information can also be used to gauge optimal incision points and identify areas conducive for fat injection. In practice, MirrorMe3D makes the process seem easy. Once the company receives and cleans up the data from partnered surgeons, it shares the files with 3D Systems, a leading 3D printer distributor known for its invention of stereolithography, a highly accurate form of 3-D printing technology that creates models by overlaying layers of printing material. 3D Systems takes it from there, transforming the data into a digital 3D model of the guide and parsing the model into distinct parts. Once the data is spliced and ready to print, 3D systems sends the files off to a ColorJet (CJP) printer. Using CJP 3D printers, 3D Systems can create any surgical guide—and can do so with high-quality coloring and precise geometric cuts. 1) The print carriage begins to move back and forth, spreading out fine layers of material for the guide's core. 2) The print carriage atop the printer lays down additional core material. 3) The printer solidifies the inside of the model and leaves excess material around the model for structural support. 4) After printing, the excess material is brushed away from the core model. 5) An airbrush is used to remove all excess material from the model. 6) The model is placed in an infiltrant to fill any holes in the model, enhance color, and improve mechanical function. 7) 3D Systems and MirrorMe3D professionals inspect the model to ensure cut accuracy, high-quality color, and functionality. Perhaps the most important component of the printing process, the last step ensures that surgeons receive the highest quality guides around. Committed to providing useful and safe guides, MirrorMe3D even goes as far as reprinting approximately 5-8% of their guides each year. Once the team at 3D Systems and MirrorMe3D has met these strict quality standards, they send the guide back to the surgeon. It is then potentially introduced to the patient and prepared to move onto the next phase in its lifecycle: surgery. The final step in the 3D surgical guide's lifecycle is its application in surgery. Depending on the guide, patient, and procedure, there are several ways the guide can be used in surgery. Whereas some surgeons might just use the guides as tools for themselves during surgery, others might show them to the patient, fostering stronger relationships with clearer communication. Emily Gorge's story offers one example of how her surgeon used the guide to meet her expectations and improve her life. Throughout her rhinoplasty surgery, Emily's surgeon used a MirrorMe3D model to reference when making incisions and shaping the crown of the nose. Her surgeon referenced the guide throughout the procedure. Holding up the guide to Emily's face, her surgeon ensured that all incisions and shaping were closely aligned with the expected post-rhinoplasty nose. As in Jaden and Anias's surgery, the 3D surgical guide proved its worth: the surgery was a success because of the precision and accuracy the guide brought to the operating table. of how the surgery might have impacted her face, because it gave her a close approximation (if not exact simulation) of what she'd look life off the operating table. 3D surgical guides have firmly established themselves as one of the surgeon's most important tools. They are helping people like Jaden, Anias, and Emily every day. With their advancement, they'll also help many others more frequently. Surgeons throughout the healthcare field are making their use common practice. Among their many applications, surgeons are now using them to improve dental implant precision, ensure limb amputation safety, and hasten surgical recovery times. They're transforming surgery as we know it. The tools contribute something far more significant than a helpful change to the healthcare field, however. They offer the possibility of new and improved life for patients around the world.